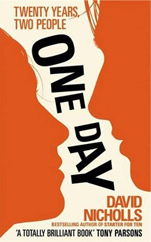 One Day By David Nicholls Emma Morley and Dexter Mayhew attended the same university in England. He, over the top gorgeous and popular and she, a very pretty intellectual type. Their paths rarely crossed until a big graduation party. One night together could have been chalked up to drinking too much and celebrating the end of college and beginning of real adult life but at the last minute they decide to exchange numbers and (albeit hesitantly!) to keep in touch. And so begins their 20 year relationship. They have their ups and downs and way way downs. They connect on many levels, laugh, cry and become the best of friends. One Day is funny and descriptive and nostalgic until the end, the very bitter end. The reader cannot help but picture darling Anne Hathaway as Emma and although I have not seen the film, can imagine she would play it perfectly. Strangely the end is rather disappointing. After being thoroughly immersed into these characters it ends with a race to the finish. One of the signs of a good read, I wanted more.